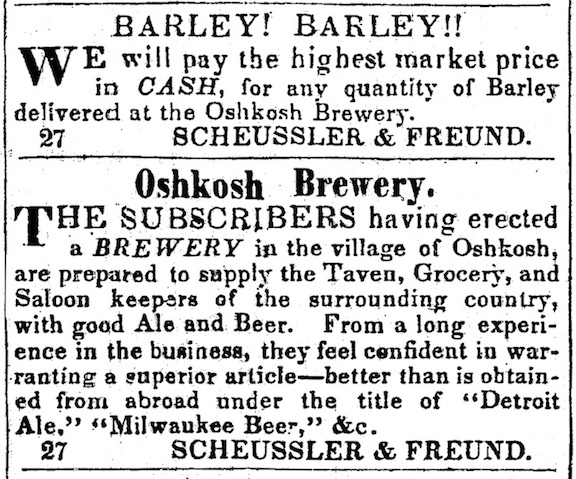 Here’s the oldest newspaper ad that I’ve come across for an Oshkosh brewery. This appeared in the Oshkosh True Democrat on September 6, 1850. 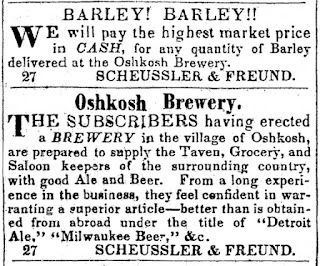 It’s for the Oshkosh Brewery of Joseph Schussler and John Freund, which was located on what is now Bay Shore Drive. If you click the image it will enlarge, making it an easier read. Note, the spelling of Schussler’s name in the ad differs from the spelling he typically used. I’ll stick with his standard spelling here. The fact that Schussler and Freund are calling on local farmers to sell them barley indicates they were doing their own malting. That’s typical of the era. Malting was then largely considered part of the brewing process and not a separate endeavor independent of the brewery. Notice, also, that they’re only looking for barley. Corn wasn’t widely used in American brewing until the 1870s. Schussler, the brewmaster of this operation, was brewing an all-malt beer. And what about hops? 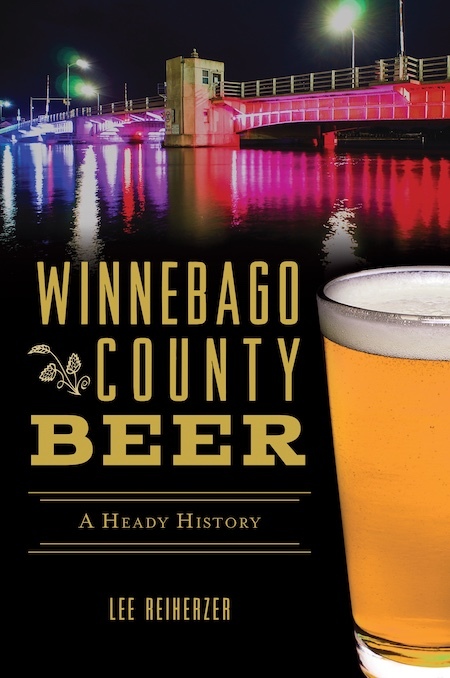 By 1850, there were already hop growers farming in Winnebago County. It would have made sense for Schussler to select his hops from the local stock. Rail lines had yet to reach Oshkosh in 1850. Bringing in bulky bales of hops from other parts of the state by horse and wagon would have been a more expensive, less reliable option. More than likely, the beer that came out of this brewery would have been a local beer in the truest sense. It’s interesting that the Oshkosh Brewery was producing ale as well as beer, which in this case would have meant lager. 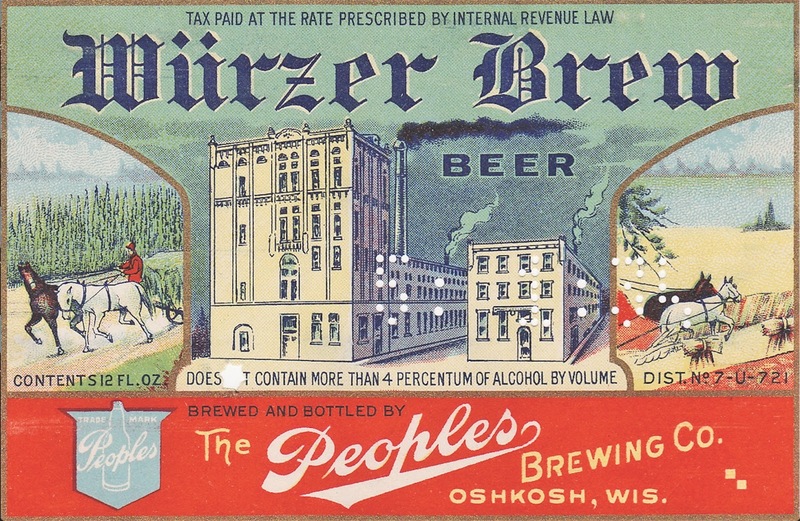 Schussler came to be known as a lager brewer, but in 1850 the Oshkosh Brewery needed to compete with the ale from Detroit that had been coming into Oshkosh for more than a year. Schussler and Freund succeeded in taking over that part of the market. Detroit ale gradually receded from Oshkosh. The Milwaukee beer kept right on coming, though. When this ad appeared there were fewer than 500 breweries in America. Oshkosh, with a population of 1,392, had two of them (the other being the Konrad brewery). That fact leads me to doubt that this is the first ad either of them placed in a newspaper. According to History, Winnebago County, Wisconsin Volume I (1908), Schussler and Freund began running ads in the True Democrat in 1849, the year the paper was launched. I’m not convinced that’s correct. I’ve dug through those papers and I’ve yet to find an earlier ad for this brewery. Maybe I need to look harder. Here’s an odd, little side note: the Oshkosh True Democrat was an ardent supporter of the temperance movement. The paper’s co-owner and editor, James Densmore, was a unique guy. One account describes him this way: “Densmore had a huge muscular body, a bold red face and an aggressive, argumentative spirit.” Sounds like a fun guy. He was also instrumental in the creation of the first commercially successful typewriter, a vegetarian, and liked to rant about the evils of alcohol. When it came to taking money from people selling alcohol, though, Densmore tended to look the other way. The True Democrat was larded with notices for saloons, liquor dealers and beer. Densmore may have been opposed to alcohol, but paying the bills came first. Those boozy ads helped to keep Densmore’s fledgling paper afloat. 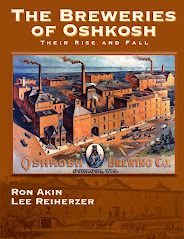 Visit this page for more on the history of the Oshkosh Brewery.